BOB Revolution CE is a great choice for parents who live in the city and want to have all-terrain stroller for off-road walks, rather that serious running. 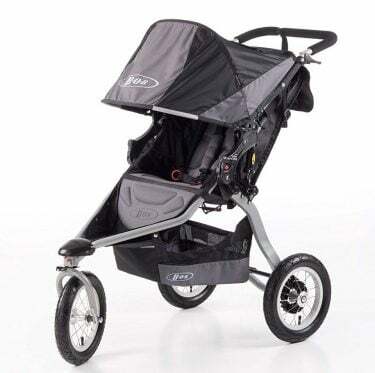 It is for sure heavier and bigger than many other standard strollers, but it’s very functional and has a lot of useful features, which outweigh its negative aspects. BOB Revolution CE is currently unavailable on the market. 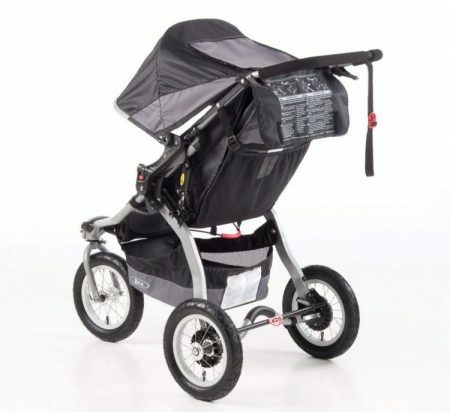 If you are looking for a running stroller check out my ranking of the best jogging strollers for 2019. If you need stroller for everyday use in the city here you can find the best modern standard strollers. BOB Revolution CE is a City Edition (CE) and it is designed for parents with active lifestyle, but rather for walking or light jogging than serious long-distance running. The producent says it is a jogger, but in fact I wouldn’t recommend to run with this stroller on tough terrain. BOB Revolution PRO and BOB Revolution SE are better choices for parents who love running. BOB Revolution CE is easy to push with one hand and as all moms know, it’s an essential feature. It is also great for parents who like to take a dog for a walk while strolling with a baby. 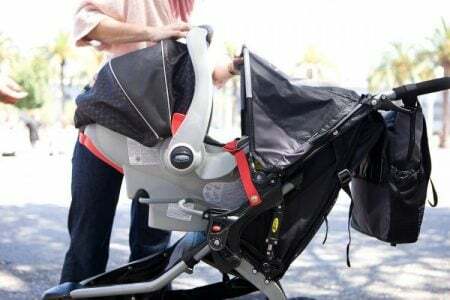 You can push the stroller with one hand and hold the leash with the other hand or chat with your friends on the phone, while your baby is sleeping or exploring the surroundings. This model is quite big and bulky and it will be difficult to do shopping with it. It is 51.5” long and the front wheel will be hitting stands very often. But compared to SE or PRO model, this stroller is more compact and lighter. It weighs only 23 lbs. BOB Revolution CE has three 12” wheels with air-filled tires. There is swiveling front wheel. 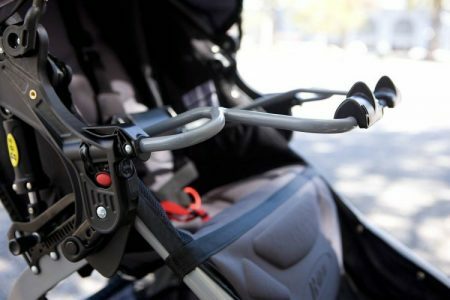 When it is unlocked it makes the stroller easier to maneuver and when it is locked the stability is increased, which is essential when you are strolling over tough terrain. Don’t worry about having flat tire – it can be easily fixed by replacing the inner tube or you can go to a bike shop and you get it quickly done. The tires can be aired up with standard bike pump. It’s important to inflate the tires regularly so they could serve you for a long time. BOB Revolution CE has smaller wheels than SE or PRO models: CE has three wheels of the same size – 12”, while SE and PRO have 12” front wheel and bigger rear wheels – 16”. BOB Revolution CE has amazing tires, especially when compared to the plastic counterparts that most strollers have. Air-filled tires are very popular recently. Not only BOB, but also other brands offer that kind of wheels, for example previous version of Bugaboo Donkey Twin also has pumped tires. If you live in a city the BOB Revolution CE will hold up even a great winter. Its tires will handle icy sidewalks. It is better for strolling in the city – on asphalt or cement paths, but not sandy beaches, hilly terrain or wooded trails. If you don’t live in a city area, the SE would be better option, thanks to its bigger wheels. For riding in the city the CE has more useful features: it’s easy to navigate in tight spaces, you can use public transportation with it easily. BOB Revolution CE is a great solution for urban or suburban parents. You can push it on city streets, sidewalks, occasionally also on uneven terrain. It fits and goes into smaller places more easily. But if you want to stroll mostly on rough terrain (dirt/gravel/sand/wooded trails), BOB Revolution SE would be a better fit for you. BOB Revolution CE has great adjustable suspension system. You can change the suspension depending what terrain are you riding on. The stroller turns easily, you can push it with one hand, almost effortlessly. And your little passenger will have a very smooth ride. This stroller glides and maneuvers seamlessly through pavement and even gravel. This model has foot-operated brake which is located in the back, between the wheels. It is easy to reach and push with one foot, but not if you are wearing flip-flops. All BOB models have really great canopies. This one has adjustable, five-position hood which provides little passenger with great shade and protects him/her in different weather conditions. This canopy is equipped with large peek-a-boo window, so you can check what your baby is doing during the stroll. Your baby will feel very comfortable during strolling in this seat. It has soft padding and the fabric is water resistant, very easy to clean (unfortunately it can’t be washed in washing machine). The seat reclines 70° down from vertical. There is also five-point harness with release button in the middle and nicely padded straps which provide safety for your little one. Unfortunately, there is no bumper bar, but if you purchase the baby tray, it can serve as it. BOB Revolution CE can accommodate a child up to 70 lbs, which means you can use it until your kid is in primary school. 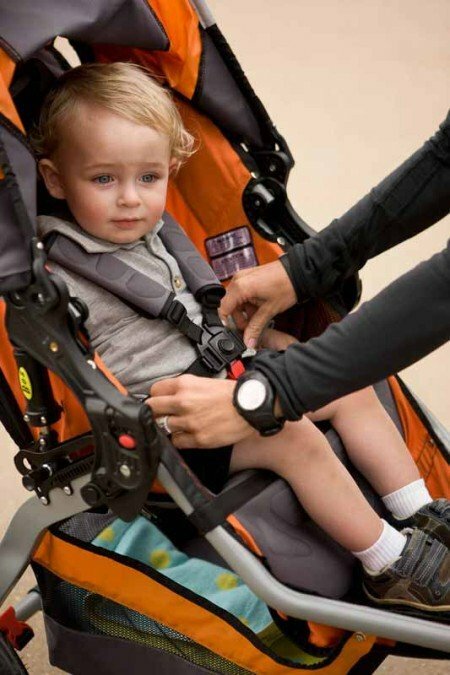 Another security feature in this stroller is wrist strap, which is attached to the handlebar. Thanks to it your stroller won’t run away from you. 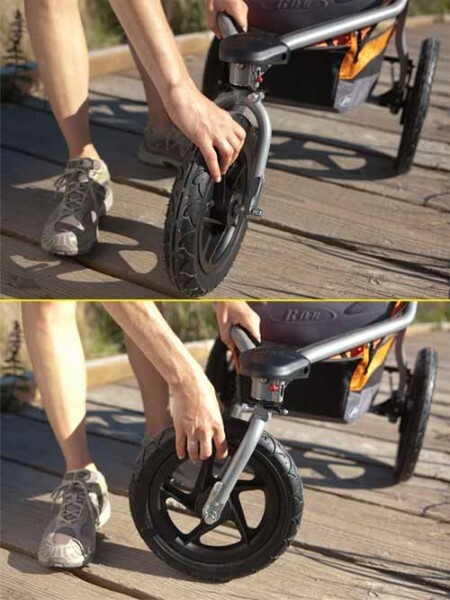 This is very useful while strolling but if you trip up during jogging, you might pull the stroller down with you. The safety strap is attached to nicely padded handlebar which provides you with comfort while pushing. I only wish the handlebar was adjustable. My husband (6’2″) complained a little bit about the handlebar height after a long stroll, that it was a bit short and inconvenient. But it wasn’t a problem during short rides. This model has plenty space for your baby’s gear and your essentials. It has a basket below the seat, which is easy to access. Many strollers have small and hard to reach baskets, but this one is really practical. The basket may not be the biggest one, but it is enough to store your baby’s necessities for a day trip. BOB CE has also large mesh pocket on the back of the seat. It is very useful for storing a wallet, keys, phone, few diapers and wipes. It would be nice to have a parent console with cup holder included, since you will need some water during strolling or hiking. BOB doesn’t come with any accessories. You need to purchase them separately. You can easily fold the stroller in two steps. I prefer one-step folding mechanism, but this one is not very difficult and you can get used to it. BOB Revolution CE has smaller wheels than SE model so it is not so bulky when open and folded. It will fit in most of the car trunks since its folded dimensions are: 39” x 25.5” x 16” (L x W x H). Although folding is fairly easy I wish the stroller would stand on its own when it’s folded. You will also need to use both hands to fold it. Many moms may think that it would be easier if the stroller had one-hand folding option so they can hold their baby in one hand and fold the stroller with another. But remember: always keep your baby away from the stroller while you are folding or unfolding it, to protect your baby from pinching or cutting fingers! Besides, this model is not equipped with automatic lock to secure the folded stroller. You will have to bend down and lock it manually by using the clip which is attached to the wrist strap. It can be quite annoying, especially for moms with back problems. Big advantage of this model is that it’s not that bulky as BOB Revolution SE or PRO. It weighs 23 lbs which means it is 2 lbs lighter than SE and 7.5 lbs lighter than PRO version. This stroller is definitely convenient to take to the park or zoo. It is great for everyday use and it’s not as bulky as we thought it would be. This stroller is just a little bit longer than most standard strollers but it can do a full turn in a very small space! There are many great accessories compatible with BOB Revolution CE stroller, but unfortunately they need to be purchased separately. If you buy them all it will definitely add up. BOB Single Snack Tray – baby tray is one of those things that are not included, which is kind of surprising for me. You need to buy it separately. There is a snack tray compatible with many BOB models: SE, CE, Sport Utility and Stroller Strides. Handlebar console – parent console also doesn’t come with the stroller. It has two holders for cups or water bottles (one on each side) and a pocket between them. I wish it was included, because it is very useful to keep a water bottle in a holder. You can of course keep a bottle in the pocket on the back of the seat, but it is quite inconvenient to grab it while strolling or jogging. The parent tray comes with a tire pump. Travel bag – this is very useful if you plan to travel a lot (by car or by plane). It is compatible with every BOB single stroller model. This bag is easy to navigate, since it has convenient handle and roller wheels. If you will travel a lot with your child it is definitely worth buying. BOB Weather Shield for Single Revolution – If you want to go out for jogging or take your baby for a stroll and there is a chance it will rain, you should take it with you and keep it for example in the basket or in the pocket just in case. It will protect your baby from rain and wind and catching a cold! The shield has a large window which is water resistant and let you keep an eye on your little one. I remember that few times during jogging with my baby it started to rain heavily but I kept the weather shield in the basket below the seat, just in case. It was very useful and quick to install. 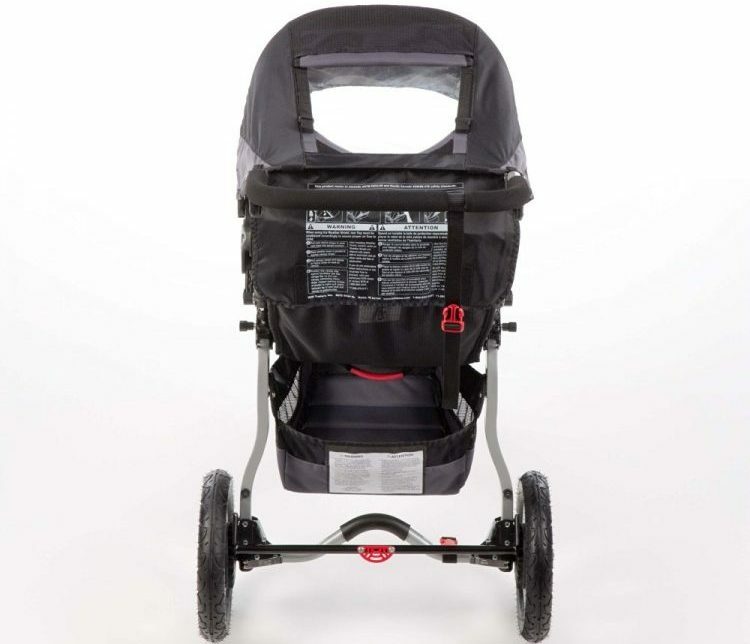 BOB Sun Shield Single Revolution Stroller for Strides – it is designed to protect your baby from sun or flying insects. It is quite useful if the baby is sensitive to the sun. I use it during spring and summer, when the sun is really scorching. BOB Revolution CE has many positive reviews on Amazon. Parents praise it for ultra smooth ride – the baby doesn’t feel any bumps. Pushing and steering is very convenient and you can do it with one hand effortlessly. Many customers consider this stroller as well-built and quality product. Few parents complain about its size after folding as it doesn’t fit in small trunks. Keep in mind that BOB Revolution CE is not available on the market right now. 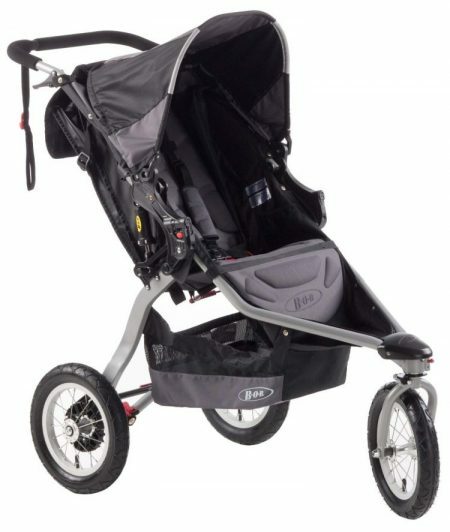 On my website you can find many more awesome jogging strollers. You can also check out my ranking of the best strollers for 2019. All pictures belong to BOB.